The Merit executive team brings a distinct set of industry perspectives to our global growth strategies and the organizations they lead. The Leadership Team is responsible for steering Merit through a transformational period in global healthcare. Together, this team drives the Merit strategic imperatives, focusing on enhanced system collaboration, therapy and technology innovation, global access and alignment of value within the healthcare system. The Merit vision remains our guiding compass. We look to our senior leaders first and foremost as the stewards of our vision, to be the most customer-focused company in healthcare. Guided by our leadership team, we look forward to extending our vision to more people in more ways and in more places around the world. Fred Lampropoulos has been in the medical device industry for over 30 years. 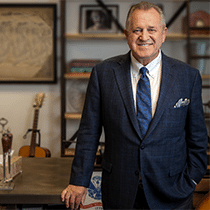 After serving as the Chairman and Chief Executive of Utah Medical, Lampropoulos founded Merit Medical Systems, Inc. in 1987, where he currently serves as Chairman and CEO. He has invented and holds over 200 patents on devices used in the diagnostic and therapeutic treatment of cardiac, peripheral, gastrointestinal and pulmonary conditions. Lampropoulos is highly involved in his community and serves on many boards. He is also the recipient of numerous awards, including the Governor’s Medal for Science and Technology, CEO of the Year, and was inducted into the Utah Business Hall of Fame. Lampropoulos is a former Special Forces Officer and an Honorary Colonel in the Utah National Guard. He holds a number of honorary doctorates, including Doctorate in Business Administration from Westminster College in Salt Lake City, recognizing his contribution to and development of industry and education within the State of Utah.